Vibrant, exciting, and extravagant dancing is the experience you can expect to get at a Native American gathering . Be moved by the vivid and inspiring Eagle Spirit Dancers exhilarating singing and dancing styles passed down from their ancestors. hey aim to cultivate and captivate all audiences worldwide about the magnificence, the craft, and the nobility of the Native American way of life. The Eagle Spirit Dancers teach the cultural significance of the dance, regalia (dress), the importance of the singing/drumming and why we practice these sacred traditions today. The talented artists, dancers, and singers come from numerous tribes including: Odawa, Ottawa,Chippewa, Ojibwe, and Cree. We invite you to be a part of our mission and movement to educate, inspire, and create a pathway to bridge the gap between all communities through these cultural traditions. 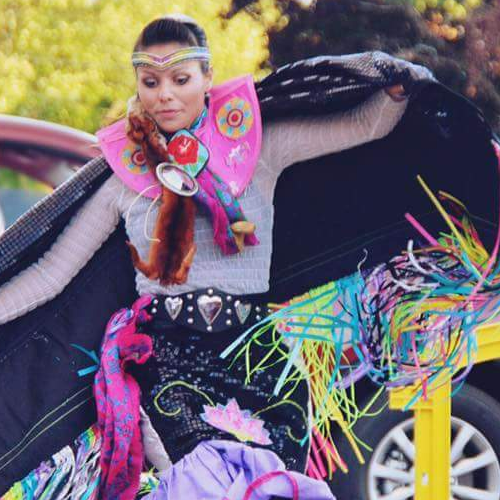 Line up includes Roberta Shalifoe (pictured above), women's fancy shawl; Theresa Chingwa, woman's traditional; Moni Fonseca, woman's jingle; Raymond Shenoskey, hoop dancer; Quinton Squander, men's fancy and his daughter, girls traditional; and Spirit Lake, drummers.